Mike Wilner (‏@Wilnerness590): That's not what it says!!!!! @PatThompson21: @Wilnerness590 [Buster Olney's tweet] says Tracy and Riggleman are the front runners. Thoughts? Mike Wilner ‏(@Wilnerness590): Sorry, trying not to sound condescending, but I'm baffled by some people's lack of being able to understand what they read. We are very excited about the Blue Jays. They made a blockbuster trade, getting a perennial all-star and pitching depth. They signed the MVP of last year’s all-star game. They’ve just picked a manager. But what’s this? Many of our most popular media outlets were recently raising the twin specters of a blown managerial hire, and the league vetoing the trade. The problem with these specters is that they are products of inaccurate reporting, and have little to do with fact. The whole thing seems to have started when someone very dimwitted realized that the league was going to review the blockbuster Jays-Marlins deal. In this deal, so much money in payroll commitments is coming to the Jays, that the Marlins are kicking in some cash to help cover the difference. The key point is that “all trades routinely are reviewed by the Commissioner's Office before becoming official,” yet Bud Selig has never overturned a trade. The trade was approved yesterday. This is false. The original tweet clearly implies that at least one and maybe more unnamed candidates are being considered. The Sun was not alone in this obvious error; sports radio the Fan reported the very same thing on the very same day, again referencing ESPN, and even mentioning Buster Olney as the source of the rumour. 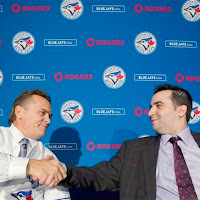 This morning, John Gibbons was hired as the team's new manager. So Toronto sports reporting stinks. This is not, in and of itself, very important. However, much more disquieting is the reaction of the public. Fan radio host Mike Wilner had a frustrating time trying to clear up the confusion of a public too quick to swallow bad reporting. This same pattern can be seen in reporting on much more important issues, with much more dire consequences. Back in 2007, Salon.com identified a little verbal inconsistency (putting aside for the moment speculation on whether the cause is duplicity or incompetence) in the news media’s coverage of casualties in Iraq in this piece. With sloppy (or careful?) word choice, militants become terrorists with a certain organization. At the time many Torontonians sadly chuckled (what else can you do?) at the gullibility of our neighbours to the south. Casual misuse of language continues to cause confusion and further ignorance for our closest allies. Unfortunately, we are not immune. If you thought that the Jays were about to decide between Tracy and Riggleman, or that the trade was about to be overturned, then you’ve been had. You can avoid this in the future by reading more closely, and being more critical of these obviously fallible sources. Chris Burt is a freelance writer who writes about sports at sportsvssports.wordpress.com, Toronto parenting at exm.nr/pw3Pvl and whatever. You can follow him on Twitter: @AFakeChrisBurt. Specifically about trades being under review, anytime a substantial amount of money is included in the deal (the $4M or $8M or whatever the figure was) the commissioners office has to sign off on it. So when it was reported that Selig would review it, it was only because he was obligated to. Strange to see things spiral in a certain way like that.